The KIDflix Film Fest of Bed-Stuy celebrates its 15th anniversary with films about funk, soul, gospel, jazz and r&b. BEDFORD-STUYVESANT — A kids film festival in Bed-Stuy is celebrating its 15th year with films honoring music and black culture. 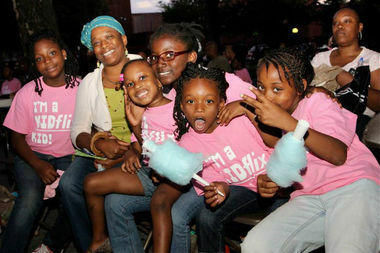 The KIDflix Film Fest of Bed-Stuy, a free annual outdoor event in Fulton Park, is organized in part by the Museum of Contemporary African Diasporan Arts and aims to portray the contributions of black artists on culture, according to the museum. For its 15th anniversary, the festival will celebrate "black music," featuring films surrounding funk, soul, gospel, jazz and r&b, according to organizers. The festival kicked off last week with a screening of the Jamie Foxx-produced "Thunder Soul" and continues Friday night with "Soundtrack for a Revolution," a documentary about the music that played a role in the Civil Rights movement. The festival will be capped off on Aug. 29 with a screening of "The Wiz," the classic "Wizard of Oz" adaptation starring Diana Ross, Michael Jackson, Richard Pryor and Lena Horne. The Aug. 29 screening also features a "Wiz" and "Thriller" costume contest and a sing-along with the film. In addition to each screening, artist and co-organizer TRUE will dJ tracks from classic soul artists like Otis Redding, Aretha Franklin, Marvin Gaye, Smokey Robinson and Gladys Knight. All screenings are free and the events begin every Friday in August at 7 p.m.
Aug. 8: "Soundtrack for a Revolution"
Aug. 15: "Rejoice and Shout"
Aug. 22: "All on a Mardi Gras Day"